Following the recent article in the Cyprus Weekly newspaper on 24/6/2017, KISA wishes to comment on the statements of the new Minister of Interior relating to the above issue, as his statements do not correspond to the reality of the situation, which is particularly alarming. 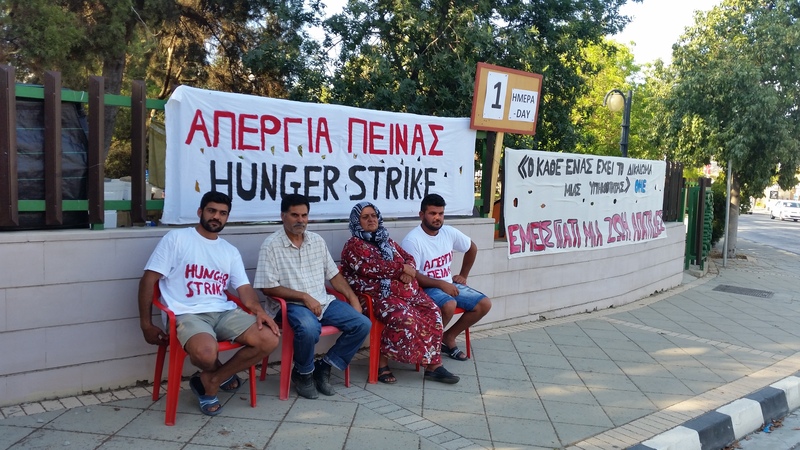 After the former Minister of Interior, Mr Hasikos, shirked the commitments he had made to them, the family in question ended up protesting this way – with two members of the family currently engaged in a hunger strike that has lasted a month (so far). In 2014, after a study conducted by his ministry, Mr Hasikos suggested, in the presence of representatives from NGOs and the United Nations High Commissioner for Refugees (UNHCR), that the particular refugees- in contrast with the other members of their family who had been granted citizenship- ought to submit their applications a year later, by which time they would fulfil the time criteria specified by law. Indeed, one year later, the members in question submitted their applications as the former Minister had suggested, yet were rejected vindictively and in bad faith on the 27/3/2017. The ruling was prejudiced against them and essentially aimed to force them to abandon their initial protest. In this regard, it is reported that on the 19/04/17 the UNHCR informed the Hassan-Janbali family that, during a meeting with the Director of UNHCR, the Minister recognised that the aforementioned negative ruling had been a mistake and gave instructions for re-examination of their applications for citizenship. A common letter sent by four non-governmental organisations, confirms this commitment. In the statements he made, the new Minister of Interior claims that the members of the family who are on strike do not satisfy the criteria for the time of residence in the country as well any other factors taken into account, such as “not causing trouble for the state” and calls the members of the family to respect the laws of the country, the fact that the country has “embraced” them and cease the strike. Such statements indicate, on one hand, the current Minister’s withdrawal from the previous Minister’s attitude and incorrect knowledge of the facts and circumstances of the specific case, and, on the other hand, the distortion of reality. KISA asks the Minister to clearly state the criteria that the family members do not fulfil. The objective criterion of the time of residence is fully satisfied, as the family has been resident in Cyprus for over 10 years. As for the factors taken into account for the acquisition of citizenship, such as integration into society and the non-creation of issues for the state, facts reveal the complete opposite. All the members of the family are very well integrated in Cypriot society, as indicated by their professional and personal ties as well as their very good knowledge of the Greek language. A letter sent to the president of the Republic by a well-known businessman from the Democratic Rally party in Paphos captures this particularly well. In his letter, which has been shared with us, he expresses his support for the struggle of the family, placing great emphasis on their very satisfying integration in the local community of Paphos. Therefore, we call upon the Minister to distinctly report which laws were broken by the persons in question and which criteria they do not satisfy. Surprising is the statement of the Minister that if the citizenship is granted, the Republic of Cyprus will violate the law and the acquis of the European Union. Indeed, the Republic of Cyprus has been criticized for its citizenship policy. However, criticism came from the European Commission, which warns that instead of giving citizenship to people who have real professional and personal ties in the country, it sells it to wealthy third-country nationals even if they have never stepped In Cyprus. At the same time, it is important to mention that Cyprus has not yet ratified – as it should have – the 1954 Convention relating to the Status of Stateless persons, which protects stateless persons from human rights violations. It is particularly indicative that among the 38 European countries, Cyprus ranks 36th for issues relating to access to citizenship and integration. Therefore, it seems the Minister has formed an inaccurate impression concerning the laws and directives that the Republic of Cyprus is violating. Finally, when it comes to the statements regarding the strikers’ refusal to work and their ‘lack of gratitude’ towards the Republic of Cyprus as they receive benefits, KISA believes that, aside from mistaken, these statements are completely populist and misleading. To clarify, it was only in 2014 that these persons received their complementary protection status without previously having satisfying access to the job market due to their status as asylum seekers. Their status was again recognised after protest, since their applications for asylum were rejected without explanation, given that as members of the internationally recognised as persecuted ajanib group, they are stateless; while their return to Syria is clearly impossible. They fled from Syria so that they can live with dignity, and have a desire to contribute to society, contrary to the Minister’s beliefs. Besides, this is reflected in the actions of the other members of the family who have already been granted citizenship. They themselves are currently signing on as unemployed at the Public Employment Service of the Department of Labour, and are waiting for their opportunity to work, which is exacerbated not only by the crisis the country is going through but also by the discrimination they face as refugees. KISA considers it is tragic that the Minister responsible for the protection and integration of refugees thinks that Cyprus’ obligation to refugees is exhausted by simply providing a benefit for living expenses without substantial prospects for weaning them off it. To proceed with the fulfillment of the commitments of his Ministry towards the refugees before their health deteriorates further, with irreversible catastrophic results.